Whether the H2O is coming down in drops or in flakes, get wet weather ready with the Bogs Classic Mid Solid boots. These warm and 100% waterproof pull-on boots feature a rubber and four-way stretch Neoprene upper designed to protect against cold and wetness even in sub-zero temperatures. Handles aid in the on/off process, and Aegis™ antimicrobial treatment controls odor. 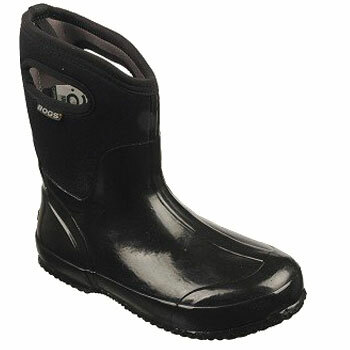 The Classic Mid Solid boot from Bogs has a rugged rubber outsole for non-slip traction in wet and icy conditions.